Camel Milk From Desert Farms – How good it is? From my childhood, I have heard many things about Camel milk. So, I was looking for some Camel products on my Dubai trip and that’s where I met with a Camel farm company named Desert Farms. They distribute Camel milk to almost all the locations and it can be ordered online also. However, I was dying to have this milk in Dubai. So, I purchased the raw Camel milk and it had a logo in it mentioning that “Everyday should be hump day”. Seems interesting! Well, I liked this humor very much. But, it took a few hours to defrost because it was frozen. Rest everything was ok… It was tastier and healthier than the cow’s milk with a rich, creamy taste like skim milk. Another interesting thing is that it won’t expire soon like the cow’s milk and hence can last for a longer period. This Desert Farm Camel Milk is almost similar to the Cow’s milk. But it is slightly different with a light, sweet, fresh taste. It is produced in a very traditional method in small batches, which could provide you a feeling of well-being after drinking it. According to many studies done, the milk is highly beneficial to the diabetic patients, mainly due to the insulin like small molecule contents present in it. Equally, acts as an anti-inflammatory and calms the inflammation (caused by the immune system dysfunction). This Desert Farm Camel Milk contains no added hormones. Equally, the Camels supplying the milk are grass fed. The Desert Farms Camel milk includes a high level of GABA. This GABA is an amino acid found in the central nervous system. It is mainly required for the proper functioning of the brain. Equally, there are more than 200 different proteins seen in this Camel milk. It is 50% lower in fat and saturated fat content when compared to the Cow’s milk. Lower in cholesterol than Cow’s and Goat’s milk. Includes low lactose content than the Cow’s milk. The milk is a great source of Calcium and Vitamin B1. Besides, it does not involve any bad manufacturing practices, whose unsafe processes can make the people sick. All in all, they harvest the first milk of the day and bottle it on-site to be shipped rapidly to the customers. Well, the nutrition stuff of this milk is pretty cool. It contains a half amount of saturated fat of cow milk. Other elements like Calcium, Vitamin B1, Phosphorus, and Potassium is also contained in this single serving. Above all, this Desert Farm Camel milk is prebiotic in nature. It means that it feeds the good bacteria in your gut for healthy digestion and absorption of the foods. This Camel Milk should be refrigerated below 40 degrees Fahrenheit before and after opening the bottle. Equally, you can store this milk for up to 2 weeks in the refrigerator or can freeze it up to 6 months in the freezer. But, once defrosted it is good to consume the milk within 3 to 5 days. 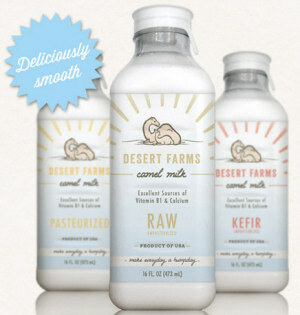 When is the best time for drinking this Camel Milk From Desert Farms? Well, there’s no specific time mentioned, you can have them whenever you feel like drinking it. Before, during or after meals or evening snacks. You can drink it in the morning hours for energy with tea or coffee. Throughout the day for sustained energy levels. 1 hours before working to build stamina. With or without meals for controlling your appetite. In the evening timings, as a low-calorie dessert replacement. Immediately after a strenuous workout for recovery and replenishment. Is Camel Milk From Desert Farms safe? Yes, Camel Milk is absolutely safe to drink as it is free of components like wheat, wheat gluten, oats, rye, barley, and malt. But, people with allergic conditions should seek a medical permission before having this food. Raw Camel Milk – The taste of this milk is slightly sweet and creamy. Raw Camel Milk Colostrum – Usually, this colostrum is collected from the Camel during her first milking (within 24 hours after birth). Soaps and creams are also available, made from Camel Milk. Raw Camel Milk Kefir – This milk is fermented using traditional Kefir. Josephine Jones “All I would say that, if you can afford this milk, incorporate it into your day to day life. It is amazing! Where to buy this Camel Milk From Desert Farms? – Camel Milk From Desert Farms for sale. Camel Milk From Desert Farms – Frequently asked questions? Hi, I am very addicted to coffee, whatever I drink I add coffee to them. So, can I take this Camel Milk with coffee? Yes, you can as it won’t cause any lumps or separate into curd. But, be sure that you steam it before you drink on adding coffee. No, this Desert Farms Camel Milk is an animal product. How much Desert Farms milk can I consume in a day? There are no limitations for this milk. You can drink as much as you can as it is not a drug or medication. Can this milk serve a replacement for breast milk or infant formula? Well, it’s hard to answer. It would be good that you seek a medical permission before giving them to the infants. here early in the break of day, for the reason that i like to find out more and more.